You can now follow the bears in California’s Yosemite National Park online. No, that does not mean the bears now all have Twitter profiles. But they are connected to the internet via satellite. They have their own website. It is keepbearswild.org. The park has about 500 bears within its borders, and last year, had over 5 million visitors. A screen shot showing the Yosemite National Park bear tracker. Now, about 20 bears are wearing collars with GPS trackers. You can follow their movements on a map of the park. But if you go looking for them, you probably will not find the bears. For both the safety of the bears, and people, there is a delay. The website also shows where 28 bears were hit by cars in 2016. Some of them were killed. With the collars, park rangers and wildlife scientists can keep track of the bears within the park. They can also learn some new things. For example, bear experts were surprised to learn that the bears begin mating in May. That is over one month sooner than they thought. They also found that the bears can travel up to 48 kilometers per day, and that includes climbing up steep mountains. The collars will allow park rangers to know if bears are getting too close to campgrounds. The rangers want to keep both the bears and the humans safe. 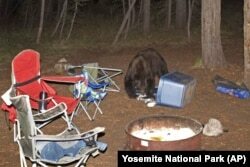 In this 2010 photo provided by Yosemite National Park, an American black bear is seen at a campground. The Yosemite Conservancy spent almost $300,000 on the mapping project. Frank Dean is the president of the conservancy. He says the new information about the bears should keep them safer. Jesse Garcia studies black bears for the state of California. He says visitors to the park need to understand that they are in the bears’ home. “You’ve got to give them their distance and always be aware, knowing that they’re there,” he said. Dan Friedell adapted this story for Learning English based on an Associated Press report. Hai Do was the editor. Are you worried about running into a bear someday? We want to know. Write to us in the Comments Section or on our Facebook page.